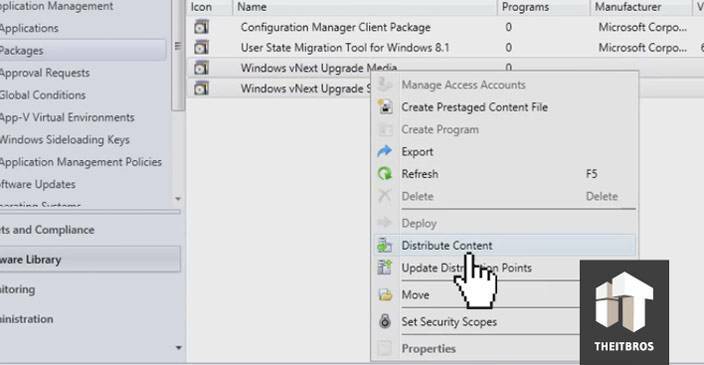 In this article we want to show you guys how easy it is actually to deploy Windows 10 using System Center Configuration Manager. It’s a lot different and a lot easier than it was with Windows 7 or Windows 8. There are new tools to get Windows 10 out there very easily. We are going to jump into SCCM. This time we use SCCM 2012 SP2 version, but you can use SP1 version as well. A newer version does give you additional functionality. Mainly what the difference is here you can do in-place upgrade of operating system. 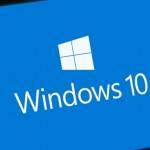 This is a pretty powerful tool to get Windows 10 out there quickly. You don’t have to worry about any enormous staff when you do migration using MDT or SCCM. For example, you don’t have to worry about drivers. 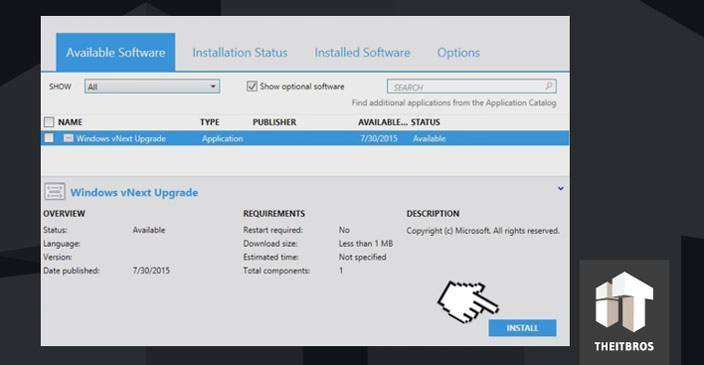 Also Windows 10 in-place upgrade keeping all the applications and all the settings. So, we are going to check it right now. 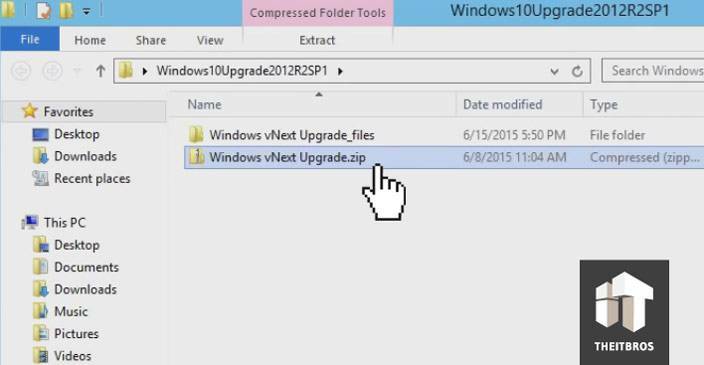 The first thing we need to do is to download Windows10Upgrade1506.zip file. This file basically has all the scripts required to do in-place upgrade to Windows 10. After that extract this file here and you will see that in the folder we have got another .zip file. Later we are going to import this file into SCCM. 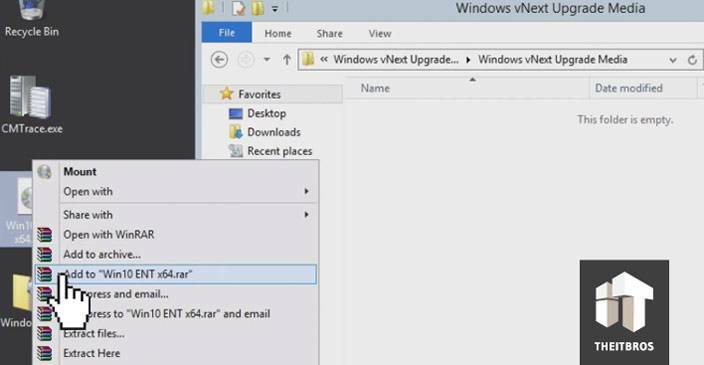 You need to open up Windows vNext Upgrade_files folder and go to Media folder. As you can see this folder is empty right now. Now we have to extract our Windows 10 Enterprise .ISO file in this folder. After that go ahead and configure our SCCM. Our configuration manager environment doesn’t have any operating system staff configured. We are starting with the clean slate because we don’t have any drivers, images, upgrade packages. What we are going to do is just click on Task Sequences and import the task sequence. Right here we have to specify the path to the .zip file which was previously extracted. It’s going to create these new packages so you can see there is a media directory and the script directory. Click on Next and we are done. So now we have a new task sequence. Actually you can edit it, but right now you don’t need to change anything in here because there is nothing that you need to configure out of the box. Let’s have a look at the packages here. We have got our media package and what we need to do is just right click on it and go to Distribute Content. Now add the distribution point and click on Next. Now we have to wait a little bit and when the circle turns green it’s done. We are ready to go at this point. What we need to do right now is to deploy your task sequence. 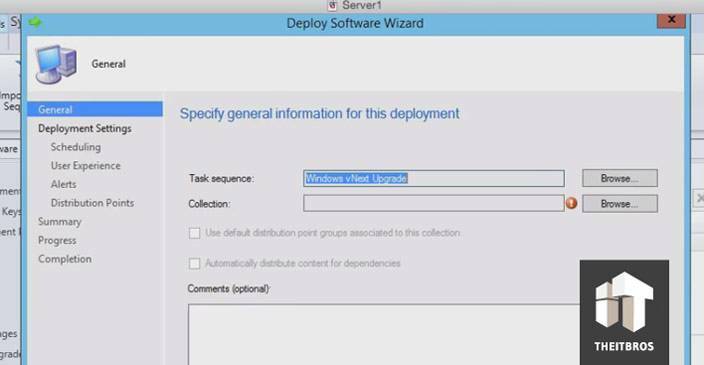 Right click on it, deploy and it will open Deploy Software Wizard. Now we have to choose the right collection which is Windows 10 In-Place Upgrade. Click Next and go to User Experience settings. 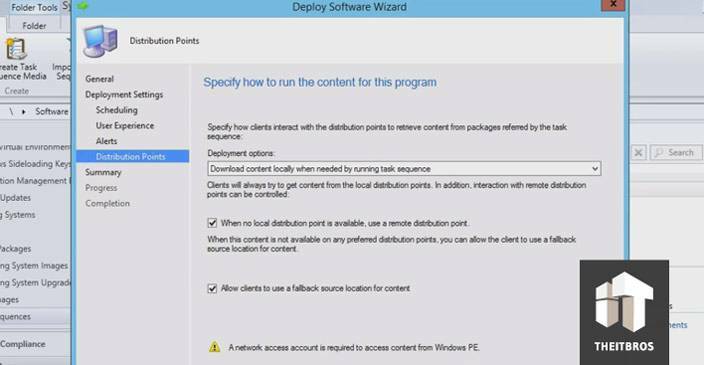 Here you have to tick on Software installation and System restart and go Next to Distribution Points settings. Tick on all the setting and go ahead. Now we have a new deployment. As you can see we have 100% compliance. This is pretty vanilla Windows 8 system so we want to do a couple of things. Let’s create some documents on a desktop. We just want to show you that this is going to basically copy a user profile. Also let’s take a look what’s installing here. We have a Juniper VPN client, Office 2013 and other programs. So, let’s see if all those things will be there when the process is done. What we are going to do now is just make this client check in. This happens every hour by default but we are going to make a check in SCCM. After that we will see the notification. 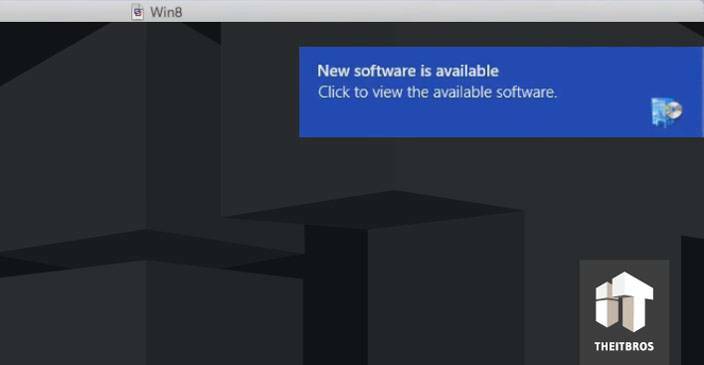 Click on that notification and in available software it is going to be Windows vNext Upgrade. Select in and click on Install. Now the downloading and installing process will start. Once it done the system is going to reboot and after that it will upgrade to Windows 10. After upgrading you will see the welcome screen. Couple of minutes and you will be there. We can find that all our documents are here. Let’s make sure other apps are here as well. We have really got everything migrated here: our profiles came through, our applications came through etc. That’s pretty much it. Let us know if you have any questions. You are free to leave them in the comment section below. 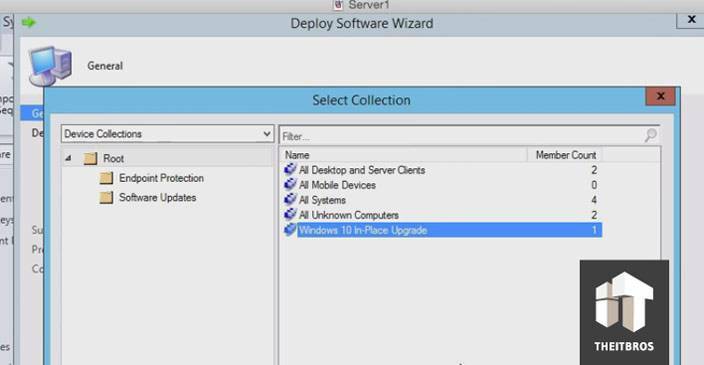 we are doing In-Place upgrade using sccm 2012-sp2. 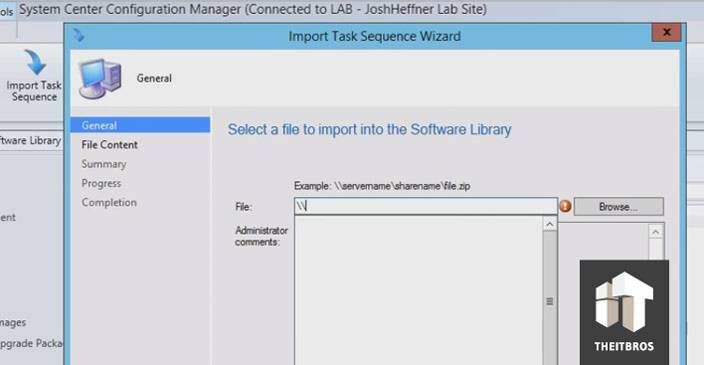 we have successfully deploy this TS in VM.while Deploying this TS in Physical machine we are getting Driver issue.In sccm 1511 we had get additional option to inject driver,so is there is any option to inject drivers in in-place upgrade TS.